Did you know Hatch Chiles make for a great dessert? Yes, really! They spice up any recipe, whether savory or sweet. This recipe calls for only 5 ingredients and you make them ahead to have as as snack for school, work, or whenever you’re in the mood for good food. On a baking sheet, spread half of the crackers quarters. Top each with 4 marshmallows and bake until the marshmallows begin to melt, about 5 minutes. Take the crackers out of the oven and immediately top them with the remaining cracker quarters, pressing down slightly. Combine the chocolate and oil in a microwave-safe bowl. Microwave on high for 1 minute, then stir the mixture with a wooden spoon. Continue microwaving on high in 10-second increments, stirring well after each increment, until the chocolate and oil are completely melted, combined, and smooth. Add the chile powder to the chocolate and stir to incorporate. 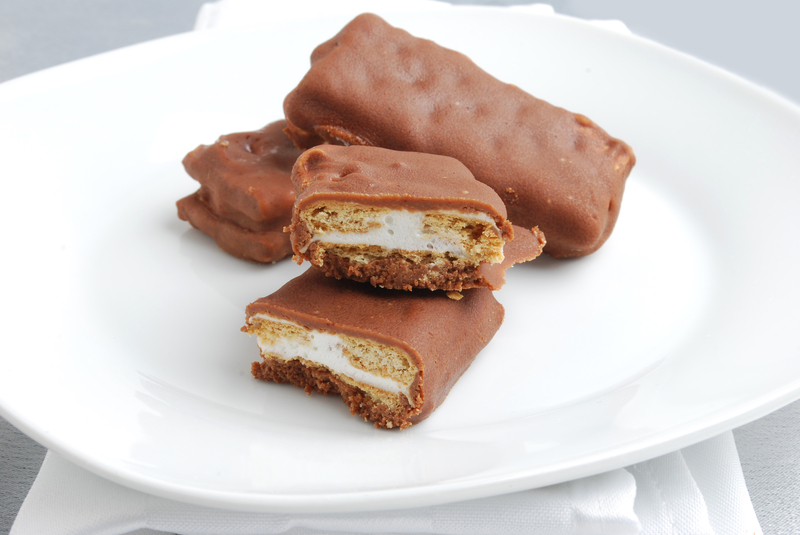 Dip each cracker sandwich into the melted chocolate, turning to coat all aides and setting on parchment paper to dry. Note: This is a fun treat with a little punch. Make sure the bowl and the spoon you use for melting the chocolate are both perfectly dry, as an moisture can cause the chocolate to seize (form a hard grainy mess) rather than melt smoothly. Get more delicious Hatch Chile recipes from Melissa’s Hatch Chile Cookbook, available at Mollie Stone’s Markets. Hatch Chiles are in all Mollie Stone’s Markets now! We will be having Hatch Chile Roast events throughout August and September. Check out the schedule and find out how to pre-order here. Be sure to share your favorite Hatch Chiles recipes with us in the comments below! Share your Hatch Chile S’mores photos with us by posting onto our Facebook page or using the hashtag #CookingWithMollies on Instagram or Twitter.